Federal prosecutors have filed another forfeiture complaint, this one for a 13th century painting that had been up for sale in the Important Old Masters sale at Sotheby’s in January. Sotheby’s voluntarily pulled the painting and told Courthouse News Service that it had “cooperated fully with the government on this matter.” Sotheby’s has not been accused of wrongdoing. The troubling issues with the work surfaced when Sotheby’s was doing due diligence on the painting. 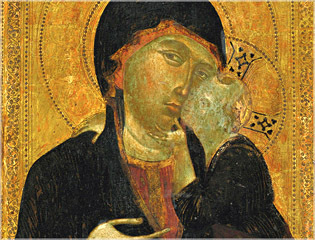 Courthouse News said the painting was a “Madonna and Child” (at right) listed in the catalogue as by a “Florentine painter within the ambit of Cimabue.” The painting had “disappeared from a Swiss safety deposit box nearly three decades ago was imported to the United State this year” to be auctioned, according to the forfeiture complaint. That report is thin on details about the lives of Aprosio and her family, and it is difficult to locate public information about them. Born Aligardi, Aprosio owned half of the painting when she died in 1980, and left her interest to her heirs Paulette and Roger Aligardi, according to the complaint. These heirs designated as a representative to that interest a man named Henri Aligardi, whose relationship to them is not revealed in the complaint. The other half of the interest belonged to a man named John Cunningham, prosecutors say. “In or about 1986, Henri Aligardi and Cunningham placed the painting in a new safe deposit box at a separate branch of UBS in Geneva,” the complaint states. But no one appears to know what happened to it since then. And the report did not say who consigned the work to Sotheby’s — or where it is now. But the evidence must be pretty good for the U.S. Attorney’s office to issue a forfeiture complaint.